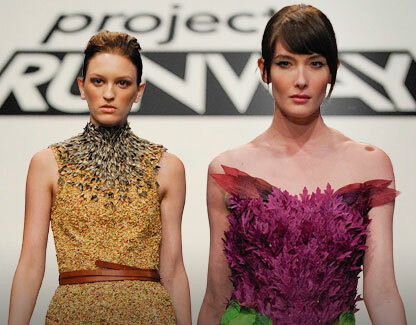 Now that all the introductions and meet-and-greets are out of the way, it was finally time to get a full episode of classic Project Runway. Of course, for some added spice they added Michael, Nina, Heidi and Tim into the opening credits—gotta keep it fresh after nine seasons, right? Challenge: Heidi told the designers they would need to "unleash their creativity," which immediately triggered memories of Season 3's dog challenge. But, oh no, they wouldn't be dressing dogs. Instead, Tim led them to Petland Discounts and gave them $300 to purchase as many pet store supplies as possible to use as the materials for the challenge. He warned them not to use obvious materials like dog beds and other fabrics, but of course many of the designers ignored him. Why won't they ever learn?! I hear the phrase "wee wee pad" more than I would ever care to recall. That'd make a good drinking game for rewatching this episode, huh? Sassy Elder Gay Bert was not feeling the challenge and thusly abused his immunity. Shame shame! Whacky Becky had an opinion on everyone and I adore her for it. Josh let out his tacky side, exclaiming that "More is Better" and spending about three-quarters of the day affixing dog toys to a pair of pumps. The Judges: Joining Michael, Nina and Heidi this week was fashion designer Stacey Bendet of Alice + Olivia fame. The judges were up to their usual crazy antics—it must be all that work on the opening credits—but we'll get to that soon enough. Anthony - I was a little worried when Anthony purposely avoided all of the materials the rest of the designer gravitated to, but in the end his bird seed dress was miles ahead of the rest. It had an incredible "wow factor" with the intricate collar and the styling with the belt was perfect. The silhouette was simple, but the texture of the bird seed more than made up for it. Yes, the skirt was a bit too short, but, to me, this was the clear winner. Josh - Tackiness aside—and there was a lot of tackiness to be had in the shoes, accessories and three pounds of makeup—Josh turned out a very cool look. The design of the aquarium jewels was fabulous and the sparkle they added on the runway was fantastic. Olivier - I'm sorry... did the judges say they liked this mess? Once again, Olivier designed a sad, drab dress and, even though it was made well, the hair/makeup was beyond terrible. Hamster shavings on eyebrows—just say it out loud and you know it's wrong! The judges praised him for the combination of textures, the styling with the plastic belt (which, fine, was cute) and the "high level of sophistication." They then ignored that he took the covering of a dog bed and reshaped it, which is something they normally hate. I just don't understand. Bryce - His model look like a slutty Smurf. I hated the midriff top, especially paired with a crazy voluminous wee wee pad skirt. There was way too much going on, and on top of all that the fit wasn't even good. Fallene - I'm not saying Fallene had the greatest look of the bunch, but I don't think she necessarily belonged in the Bottom Three. The colors were all wrong, the silhouette was too simple and the top looked way too short next to the huge belt, BUT the texture in the skirt was interesting and she made the unconventional materials look like actual clothes. That should count for something, no? Joshua - In a challenge in which designers were braiding leashes and gluing bird seed, Joshua took fabric from an umbrella to make an ill-fitting, ugly top. It was too safe and too unimaginative, especially considering the train wreck he produced last week. Plus, those snakeskin heels were an atrocity. Honorable Mention: I thought Anya should've gotten some praise for the way she manipulated the dog leashes into a colorfully chic top and Danielle once again flew under the judges radar despite her obvious talent—that netted top was a great way to use her materials! Dishonorable Mention: Ohhhh, Bert. You can't get immunity and then abuse it. You just can't! Any other week, that mess would've gotten you auf'd and we just can't have that, Sassy Elder Gay! And, Julie, don't think you got away scot-free with that disgusting weaved dress made out of dog food bags. At the very best it was a tired ripoff of Korto's fabulous seat belt dress in Season 5. In reality, this should've been in the Bottom Three. Kors-ism of the Week: A fun new feature in these Project Runway reviews in which we'll rejoice and giggle over Michael Kors' best quip of the week. The winner from this episode: when he called Josh's model "Sea Vixen Barbie" for having way too much makeup and styling. In close second was when he said you'd have to have candy corn for teeth to wear Fallene's Miss Pumpkin dress at the Autumn Harvest Festival. And the winner is: Olivier. Huh? Wha? Who?! I'm not sure how that happened, so I'm going to pretend it didn't. Deal? Auf Wiedersehen to: Joshua, who probably would've had a nervous breakdown if he hadn't been graciously released from the stress of life on Project Runway. He's probably better suited for banking, anyway. So here we are, two episodes down. What did you think of the judges' puzzling choice for a winner? Were you disappointed in Bert? And can we agree to put a moratorium on the use of the phrase "wee wee pad"?